Stanton Creek Lodge offers tent sites and RV sites as well as a bar and restaurant for guests' enjoyment and convenience. 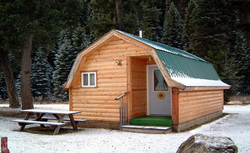 The lowest nightly rate for cabins is $39.00, the highest nightly rate is $79.00. All cabins include linens and towels. Some cabins have satellite TV and a microwave oven. There is a full-service bar and restaurant on the premises. Yearly events include the Annual Show and Shine Car Show on Labor Day weekend. This event is highlighted with a parking lot dance in the evening. Available for company picnics, family reunions, group campouts, weddings and receptions. Please call 888-5040 for reservations and information. Family guides available for lake and stream trout fishing.